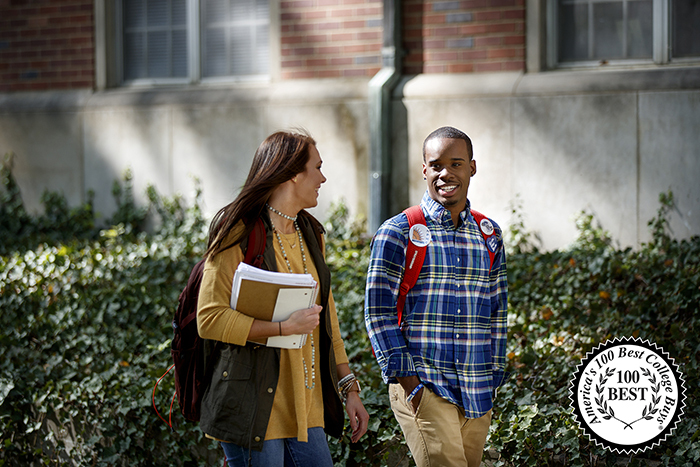 MARTIN, Tenn. – The University of Tennessee at Martin is listed among “America’s 100 Best College Buys,” a listing compiled by Institutional Research & Evaluation, Inc., of Rome, Ga., for the 12th consecutive year. The University of Tennessee, Knoxville, Tennessee Technological University in Cookeville and Union University in Jackson join UT Martin as the only Tennessee universities listed. MARTIN, Tenn., Oct. 24, 2017 – A BEST COLLEGE BUY – UT Martin is listed among “America’s 100 Best College Buys,” a listing compiled by Institutional Research & Evaluation, Inc., of Rome, Ga., for the 12th consecutive year. The university is one of four Tennessee higher education institutions listed. Pictured are UT Martin students Sarah Beth Mullins, a junior from Dyer, and Ashton Sawyers, a sophomore from Gallatin.